KwaZulu-Natal took the top spot in the HIP2B² 3M Innovation Challenge, with Grade 10 Uxholophambili High School learners Nhlakanipho Shezi and Thabani Dlamini of Mpumalanga Township earning the title of “South Africa’s Top Young Innovators 2012“.The two were chosen at a finalist function at 3M headquarters in Johannesburg recently where they presented their idea in front of an audience including newly appointed Minister of Science and Technology Derek Hanekom. The winning team received a R10,000 cheque from Huge Telecom for science equipment for their school as well as additional prizes. The learners’ winning ‘pot washer’ innovation fit the project brief, which was to propose a solution to a real problem that affected them, their family or their community. Their idea developed from wanting to find a solution to the calluses on their mothers’ hands, developed from frequent scrubbing of their family potjie pots. Leading up to the finals, the winning learners were joined by other competing Grade 10 finalists from communities in Kwazulu-Natal, Gauteng and the Western Cape for an eye-opening week of career exposure and personal development with industry specialists and mentors that ended with the presentation of their conceived innovations to a judging panel. All the finalists came from schools in disadvantaged areas, from urban townships to remote rural areas, and stayed together in youth camp and hotel accommodations. Backed by the Department of Education, the Challenge is the brainchild of HIP2B², the non-profit youth organisation founded in 2002 to promote the study of maths, science and technology-related subjects as a means to develop entrepreneurial skills and analytical thinking, along with valued partner, innovative multinational technology company 3M. It kicked off in May with an Awareness and Skills Development Campaign aimed at instilling a culture of innovation, which reached quintile 1, 2 and 3 schools from each of the three participating regions. Learners in these events were then invited to enter, in teams of two, their own innovation which proposed a solution using science and maths applications to the problem they identified. “It was amazing to be part of the journey that the finalists have experienced,” added Treasure. “All ten of them have won big-time with the exposure they got to both the specialists themselves and the process of innovation. The way they shone so brightly yesterday with passion, enthusiasm and excitement just underscores the acute need to find, nurture and mentor the young talent that exists all over SA and assist our youth in laying the groundwork for bright futures through the study of maths, science and technology,” said Treasure. The other finalists and their innovations were: Masonwabe Jubase and Skhumbuzo Nkosana from Gauteng (solar-powered window), Yandisa Mfaku and Lutho Tyalimpi from the Western Cape (Pen 1000), and from Kwazulu Natal: Nompilo Noluthando Gabela and Nkanyiso Mbongwa (mobile wheelchair climber) and Wendy Rebecca Hadebe and Nobuhle Pretty Majola (Upgrader: Tracker in backpack). Other prizes awarded to the two winners include laptops for each. 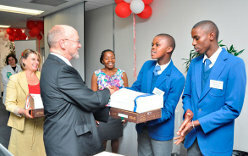 TIA sponsored iPads for each winner, as well as scholarships to attend the University of George Entrepreneurship programme at UJ for 3 weeks in December. The Stuart Ntlathi Science, Engineering & Technology Institute sponsored a Blackberry each for the winners, as well as an all-expenses paid weekend at the Innovation Indaba for the first prize winners as well as the Upgrader Team.